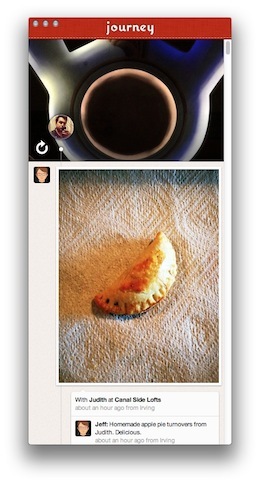 Path is one of our favorite daily digest apps because of its beautiful interface and focused take on the social network. Now, you can view it on the Mac courtesy of an open-source project called Journey. The app is limited in its functionality at the moment, and is essentially just a read-only stream of your Path home feed, but it is still very cool. Update from Path’s Dave Morin at the bottom of the post. You can grab the Journey app on the project’s home page here, where there is also a link to the project on GitHub if you’d like to contribute your time. 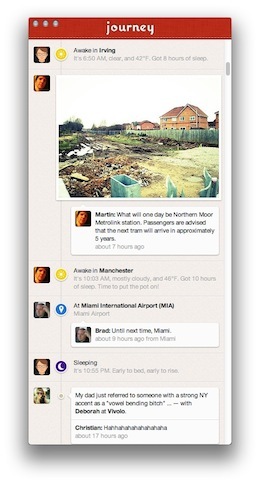 Once you’ve got it installed, you just log in and are presented with a continuous stream of your Path activity. There’s no functionality deeper than that, but the guys say that there will be more in the future. The fact that it’s open-source should help with that as well. Needless to say, this is a completely unofficial app and it remains to be seen what Dave Morin’s startup will make of the effort. So, for now, it’s a cool way to keep track of your current Path home screen, if not much more, but it looks great so far and presents the Path aesthetic well on your Mac desktop. Once publishing becomes available this thing has a good chance of becoming part of my default daily launches.